It seems that not a day goes by without a commentary about Unicorns, a Silicon Valley-coined term used to describe a startup (pre-exit) with a valuation exceeding $1 billion. The number of Unicorns, the vast majority of which are US software companies, has recently crossed the 150 mark, according to the TechCrunch Unicorn leaderboard. Topping the US Unicorn list are high flyers like Uber at $51 billion and Airbnb at $25.5 billion, followed by companies that are mostly concentrated in three industries: Consumer Internet, E-commerce and Software. Unicorns have captured the attention of investors, analysts and other market observers who are trying to understand the factors driving the formidable valuations commanded by these mythical ventures and, in some cases, bet on their future, or even announce their sudden demise. Since we at Foresight Valuation Group specialize in analyzing the valuation of intellectual property (IP) as a strategic business asset on the one hand, and the valuations of startups on the other hand, we took upon ourselves to look into the most recent list of Unicorns and try to understand the patent position of these companies, and how it may be correlated with valuation. Of the 151 current Unicorns, 95 were listed under a US designation. Patent assets held under the name of inventors or not yet having been assigned to the corporate entity, were not included in this analysis. The patent count only includes those patent assets that have been published, and therefore may not represent the full number of US patent assets owned by any Unicorn due to the 18 month delay in publication. 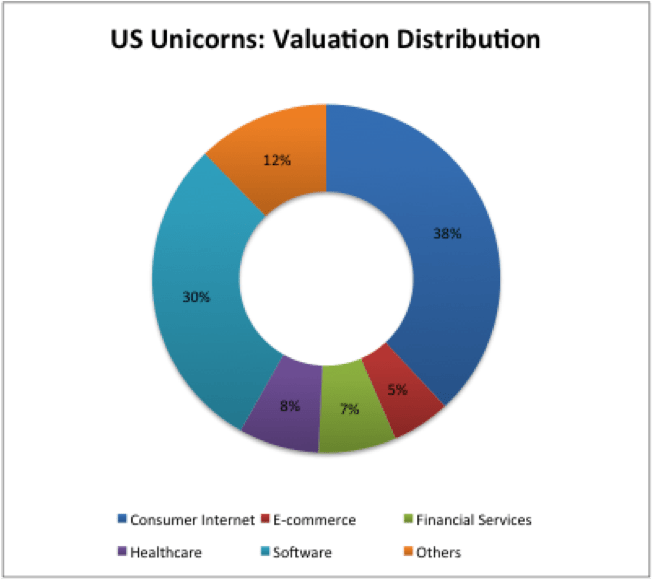 For consistency of data, Foresight relied upon the Valuation, Funding, and Market designations given to the Unicorns by CrunchBase and published by TechCrunch. Since our sample consists of relatively young startups (the median age of the US Unicorn group was 8 years), and US patents take at least 3 years to issue on average, we did not expect a fully mature patent portfolio with hundreds of assets. In addition, our experience shows that emerging Software companies (which constitute over 65% of the sample) are less likely to have a large IP portfolio, as compared with pharma, biotech, or hardware companies, as their valuation relies more on the number of users in the early stage. Having said that, given the large resources available to these companies (median funding of $277 million), and the high exposure created by the Unicorn valuations (median valuation is $1.35 billion), we were looking for indications of a solid intellectual property foundation that could mature with the company and support the sustainable growth and competitive positioning of these Unicorns. 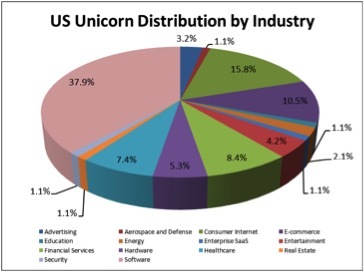 Overall, we found out that 30% of US Unicorns have no US patent assets at all! 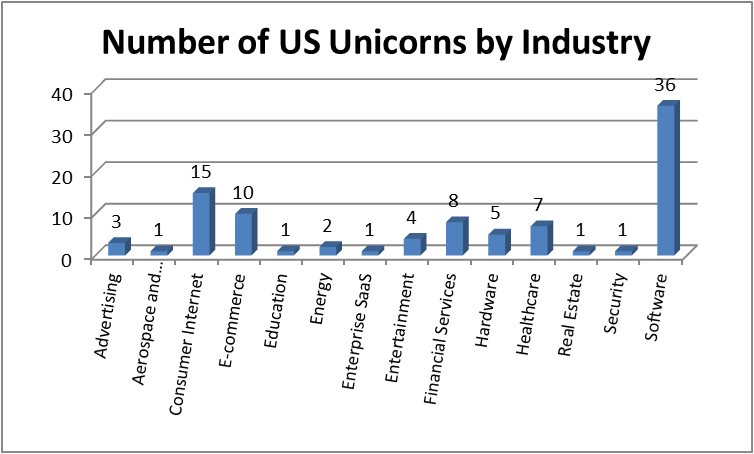 About 62% of US Unicorns have only 10 or less (issued and pending) US patents in their name; these companies account for more than $157 billion in collective valuation and $25 billion in combined funding. Taken as a group, there’s an “IP Gap”: the value distribution is not correlated with the IP distribution: 53% of total US patent assets are assigned to only 8% of companies, which account for 17% of the overall value and 11% of the overall funding. This “IP Gap” varies by industry, so some industries represent a more balanced ratio of IP holdings to valuation, as a percentage of the total group, but some industries are completely out of balance, like the Consumer Internet industry. The CrunchBase definition of “Consumer Internet” includes a wide range of companies such as Uber, EventBrite, SnapChat and Airbnb. While this group of companies received 33% of the cumulative funding and accounts for 38% of the combined valuation, its members collectively hold only 8% of the patents, as seen in the chart below. Taken together, these high level findings seem to lead to a preliminary conclusion that IP assets are not an important factor driving Unicorn valuations, nor do IP assets seem to play a critical role in the business strategy of a large percentage of these companies, as over 60% of Unicorns have fallen behind in securing a strong IP position. 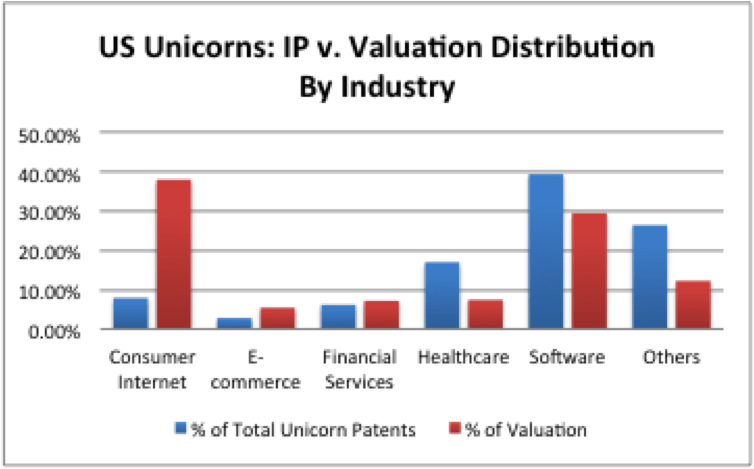 Should Unicorn Investors be Alarmed by the IP Gap? “At Nest what we did was make sure that we are putting [effort in] a ton of patents … this is what you have to do to disrupt major revenue streams.” — Tony Fadell (Founder and CEO, Nest Labs). Like Nest, many of the US Unicorns, such as Uber and Airbnb, are disrupting existing, well-established industries, where having a strong IP position is absolutely critical. This point is particularly poignant when disrupting existing, well-established industries using Consumer Internet platforms, like many of these Unicorns do. An example of such a situation is that of booking sites that accounted for over 40 percent of travel reservations last year. These companies quickly realized the need to protection their disruptive technology to prevent the hotel chains from recovering this lost revenue stream. While hotel chains were slow to patent their ideas, if at all (i.e., Starwood Hotels and Resorts have 5 US Design patents, Hilton Worldwide has no US patent assets, and Marriott International has one US Utility and 2 US Design patents), online travel bookings sites created a market with over $150 billion in gross booking in 2013 and were quick to seek protection for their innovations (for example, Priceline.com has 95 US patent assets, Expedia has 39, and Kayak has 25 – each booking site has more than Starwood, Hilton and Marriott combined). While the IP gap documented in our study obviously does not hinder the billion dollar valuations in the short term, we predict that it could pose serious problems in the long term, as these Unicorns strive to sustain their competitive advantage, or approach an exit event. We also predict that this gap could serve as an opportunity for increasing the liquidity of some IP assets in the marketplace, as some of these companies will no doubt show up as buyers as their exit event approaches, as they try to enter new markets, as they encounter incumbent patent lawsuits, or any such event that forces them to strengthen their IP position. We further examined a group of “exited Unicorns”, as listed by CrunchBase, to gain additional insights as to their IP positions at the time of their exit event (IPO) by comparing the portfolios of current Unicorns to those of exited Unicorns. It should be noted that we did not differentiate between organic patents v. acquired patents which might impact the true number of company patents when determining past patent asset counts for exited Unicorns. With the exception of three exited Unicorns: Lending Club, Shopify, and Zulily, all 9 remaining US Unicorns had sizable IP portfolios at the time of their IPO, much larger than the median US Unicorn portfolio (8 patents) of the current Unicorn group that we analyzed for this study (see table below). Facebook currently has more (and had nearly as many at the time of IPO) patent assets than the entire list of 95 US current Unicorns. Groupon has more patent assets than all 10 current E-commerce Unicorns combined. LinkedIn has over 300 more IP assets than all 36 software Unicorns combined. 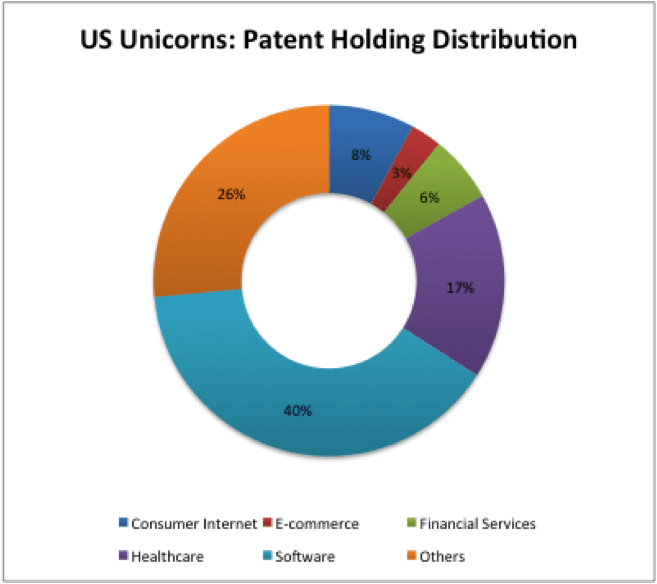 Is the IP Gap Likely to Lead to Patent Purchase Spree by Unicorns? There are several junctures where any company, and in particular a Unicorn with an abnormally high valuation, is most vulnerable when having a weak IP position: entering new markets with established incumbents, and approaching an exit point such as an IPO (or M&A). Under current US “first to file” patent regime post-AIA, Unicorns that show no organic patent growth may have lost the ability to patent a large portion of their core inventions due to missing key priority dates, and may need to make up for it by buying patents (or companies holding patents) in response to competitive threats, spending hundreds of millions of dollars in the process. Google’s acquisition of Motorola Mobility for $12.5 billion in 2011 was primarily driven by the need to improve its IP position through a massive acquisition, in order to enter the mobile market. Google has since become one of the largest patent holders with over 23,000 active US patent assets, including over 19,000 grants and close to 5,000 applications. Facebook, one of the original Unicorns, was hit by a patent lawsuit filed by Yahoo a month prior to its IPO, which is a very vulnerable exit point where a lawsuit can be detrimental and potentially even derail an IPO. Since it had very few patents to fight back and countersue Yahoo, Facebook ended up paying hundreds of millions of dollars buying patents from AOL, IBM and Microsoft in order fight the lawsuit and bolster its IP position to reduce its exposure in the future. 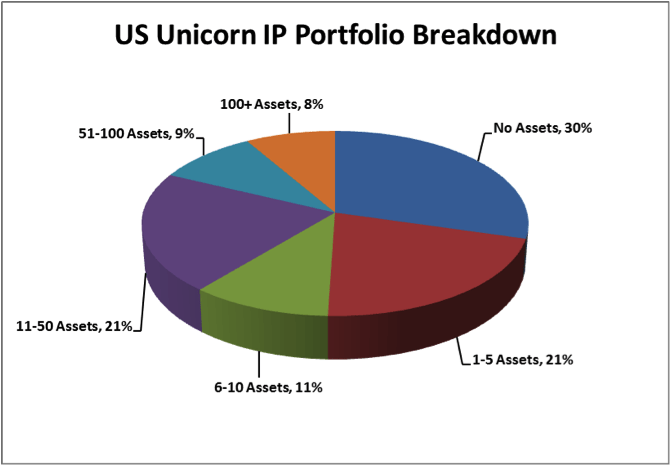 In conclusion, while some of the Unicorns analyzed in the study have embarked on the journey of creating a solid IP portfolio, as many as 61% of US Unicorns seem to have fallen behind. It is in the best interest of management and investors of these companies to examine their IP position and analyze their exposure, particularly if they are planning to enter new markets, are facing impending litigation or are approaching an exit event. This is a very interesting study and unfortunately may reflect a lack of awareness of the value of a properly constructed patent portfolio as a business asset. A patent program can be used to stimulate innovation, direct aspects of R&D, and to create a means for exerting leverage in negotiations, responding to threats, erecting a barrier to entry, and in general providing the portfolio owner with a tool to better navigate the business and legal challenges a company may face.